Monthly tuition is based on how many hours (per week) the dancer is enrolled. Tuition is payable by cash, check or credit card. Tuition is due on the 7th of each month. June tuition may be requested in May due to the Costume Distribution Policy. A $25 service fee will be charged for returned checks. No refunds will be issued for any reason, after the second class of the month. Bring a water bottle to class if you are at the studio longer than 1hour; however, no food, drink, gum, or candy is permitted in the studio area. Dancers should use restroom before class. Dancers will demonstrate self-control by not horsing around or goofing off. No hanging or sitting on the ballet barres. Jewelry and/or watches should not be worn in class. Hair must be pulled back off face and neck, preferably in a bun. 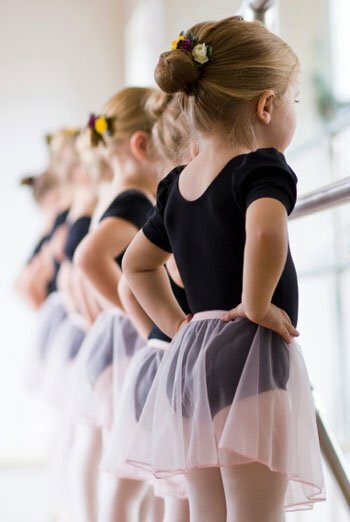 Tap, Jazz, Modern, and Contemporary classes must be accompanied by a Ballet class. We know dancers may need a healthy snack, so please make good choices. Remember to drink only water before/after/during class to hydrate! Please do not leave your belongings in the reception area. Be on time to class. Dancers are expected to be dressed and prepared for class BEFORE class begins. Students must wear cover-ups over their dance clothes, to and from class. No running, horsing around, loud or rough play. Do not touch other students’ belongings without permission. Please dispose of all food trash in the receptacles outside of the studio. Students should arrive on time and properly dressed for class. If your student arrives more than 10 minutes late, it will be at the discretion of the teacher whether the student participates in class or watches. Regular attendance is absolutely necessary if your dancer and his/her classmates are to receive maximum benefit from the class. No credits, refunds or make-up classes will be offered for missed classes. In the rare instance when a class is canceled by the instructor, a make up time will be made available. If a student is sick, we ask that the parent notify us that he or she will not attend that day. Girls & Boys - Leggings, sweatpants, or other loose-fitting active wear. NO jewelry, with the exception of earring studs. Classes will begin in August and will run through the school year concluding with a dance recital held in June. Participation in the recital is not mandatory, but it is an exciting and rewarding opportunity for your child. Information about recital tickets, the rehearsal, costumes, tights, etc. will be provided in newsletters and on the website. No videotaping is permitted at the recital. All those who participate in the June Recital are required to have a costume. The youngest dancers will also receive a pair of performance tights with their costume. Combination classes will use one costume for their ballet & tap routine in the recital. Jazz classes require a second costume. The manufacturer does not accept returns; therefore, the costume fees are NON-REFUNDABLE. SAVE $10! A $10 credit per dancer will be applied to all costumes that are paid in full by the first of November. We will have a payment plan available for those that would like to take advantage of paying costume fees over a 3-month period rather than one lump sum. The first installment will be due in October; the second in November; and the third in December. The $10 discount will not apply to this plan, unless those balances paid in full by November 1st. $75 — Dancers in Ballet, Tap, & Tumbling Combination Classes. (Approx. ages 3-8) Includes one (1) Costume and a pair of tights. $135 — Dancers in Ballet, Tap, & Jazz and/or Acro Combination Classes. (Approx. ages 8-12) Includes two (2) Costumes, no tights. $210 — All dancers NOT in a combination class. (Approx. ages 10-18) Includes three (3) Costumes, no tights. $270 — All dancers NOT in a combination class. (Approx. ages 10-18) Includes four (4) Costumes, no tights. All tuition (including June) must be paid by the 7th of May, before costumes are distributed. An additional fee for shipping or rush delivery may be applied to any costumes ordered late. Costumes are handed out approximately three weeks prior to the recital. All costume accessories and head-pieces will remain at the studio until the recital. Parents are welcome to observe class during our two observation weeks in October and March. All other classes are closed to observers. This policy is for the benefit of your child. A class free of distraction provides the best atmosphere for learning. No siblings or other children may observe during watch week. Let your dancer have your full attention. Check the website and newsletters for specific observation dates and times.